In Evicted, Princeton sociologist and MacArthur “Genius” Matthew Desmond follows eight families in Milwaukee as they struggle to keep a roof over their heads. 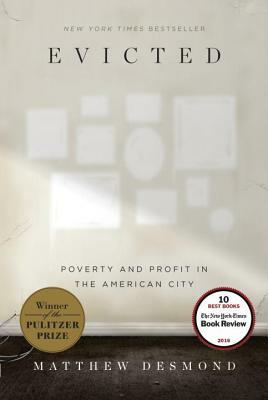 Hailed as “wrenching and revelatory” (The Nation), “vivid and unsettling” (New York Review of Books), Evicted transforms our understanding of poverty and economic exploitation while providing fresh ideas for solving one of 21st-century America’s most devastating problems. Its unforgettable scenes of hope and loss remind us of the centrality of home, without which nothing else is possible. "Astonishing... Desmond has set a new standard for reporting on poverty." "After reading Evicted, you’ll realize you cannot have a serious conversation about poverty without talking about housing.... The book is that good, and it’s that unignorable." "It doesn't happen every week (or every month, or even year), but every once in a while a book comes along that changes the national conversation... Evicted looks to be one of those books." "Should be required reading in an election year, or any other." “Gripping and important…[Desmond's] portraits are vivid and unsettling. "[An] impressive work of scholarship.... As Mr. Desmond points out, eviction has been neglected by urban sociologists, so his account fills a gap. His methodology is scrupulous."